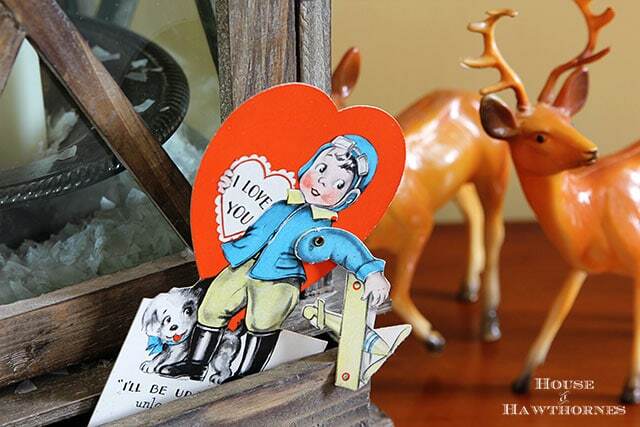 I like to tuck old valentines here and there throughout my house this time of year. 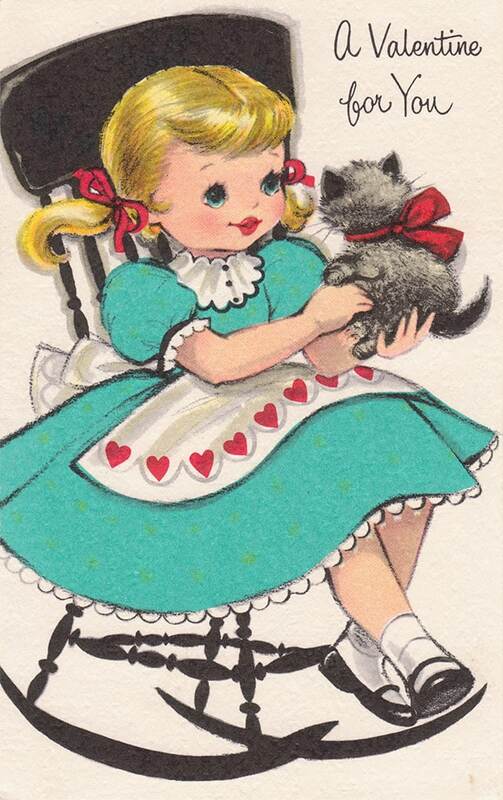 There’s just something easygoing and fun about running across a random valentine in the house. Makes me smile when I pass by them. 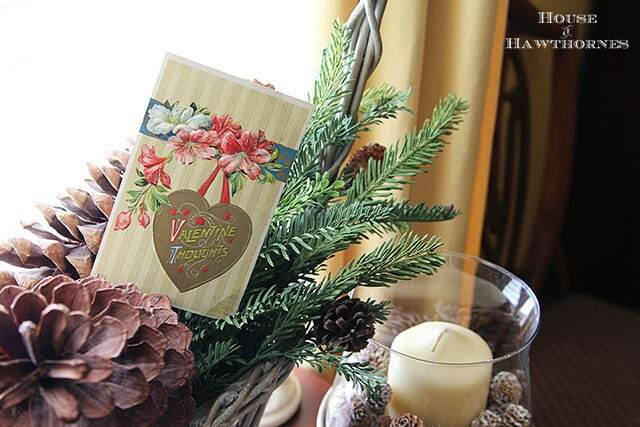 I think after the whole hoopla and excessive pageantry of decorating for the Christmas holidays (it makes me tired just typing about that), it’s time to take it down a notch or dozen for Valentine’s Day and just decorate for the fun of it. Nothing formal or fancy, just a bit of color and humor to break up the monotony of February. One tucked here. Another tucked there. Here a tuck, there a tuck. Everywhere a tuck tuck. Why yes, I still have some plastic deer hanging around the house, thank you very much. I left them out after Christmas, because I thought they still looked winter-ish. Right about now, I’m thinking it just looks like I’m one of those people who take forever and a day to take down their Christmas decor. Really, there’s no colored lights hanging from the gutters or Santa’s sleigh setting on my roof still. Speaking of Santa, I have a gift for you (or “4 U” if you’re hip and cool and in the know). 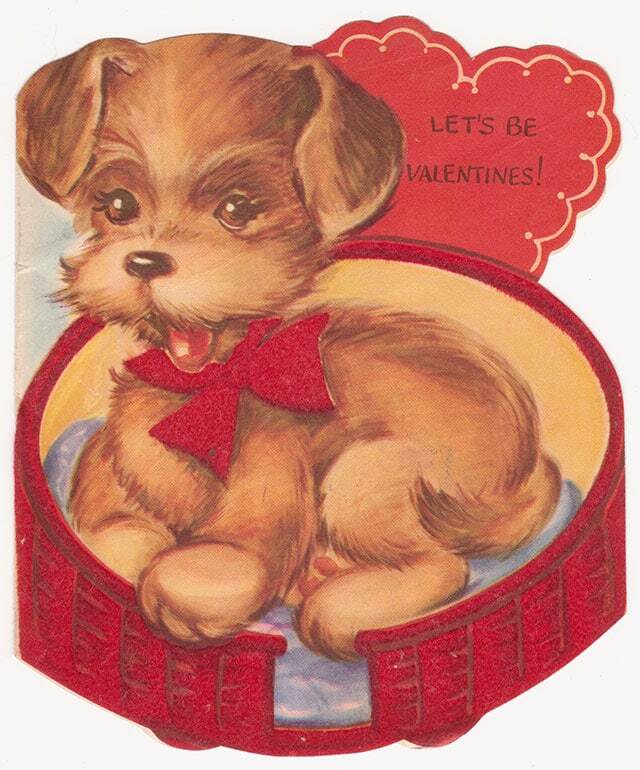 I scanned a few of my recent valentine card finds. Please feel free to print them off and tuck them around your house. You can either left click on them to enlarge and then right click on them to save or print. Or get all fancy and use the Flickr link provided below each valentine to get the high resolution (more detailed) image to print. And just to make this post really, really long and full of a massive amount of links, you can check out my Vintage Dog Printables and my Vintage Animal Printables if you want to get your vintage cow/sheep/dog fix on also. They’re not valentines, but they deserve a little love too. 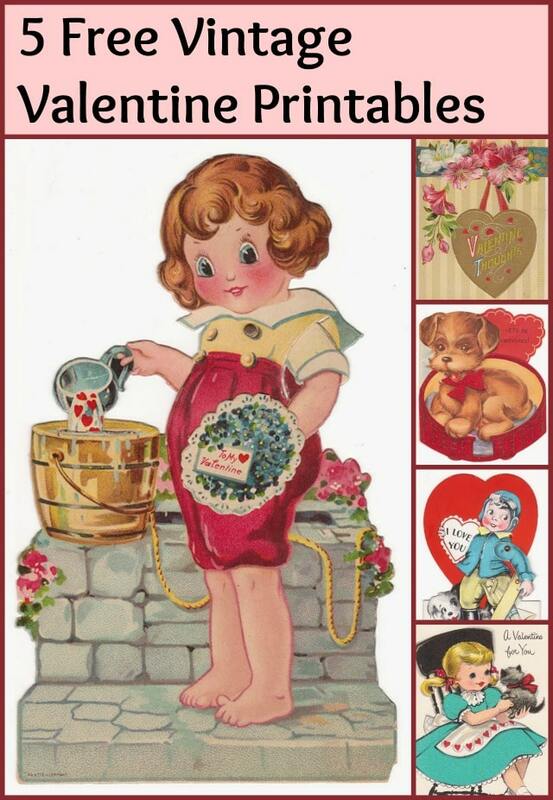 I’m a tucker, too and love old Valentines. I couldn’t save them on flicker, but I’ll save them from your blog post. Thank you so very much! You’re a sweet Valentine! Hugs! Oops,I just fixed the links so they go straight to the download page. Thanks for catching that! Long? I’m the queen of long. And you’re the queen of wit and tuck-tuck. I haven’t done a darned thing to decorate for Valentine’s Day. Kind of in a decorating slump. Oooh! I love these! Thank you!! 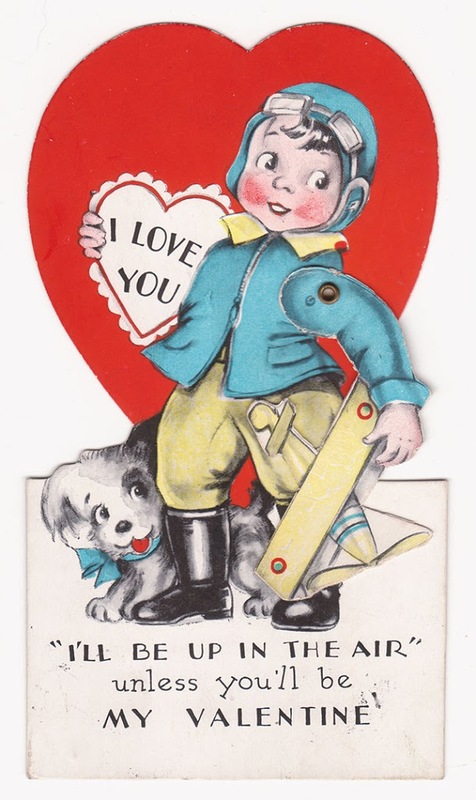 I LOVE these vintage valentines. They look so sweet tucked away. Ha! Kindred spirit here! I’ve got them everywhere. Mr OP just shakes his head. He knows me so well. 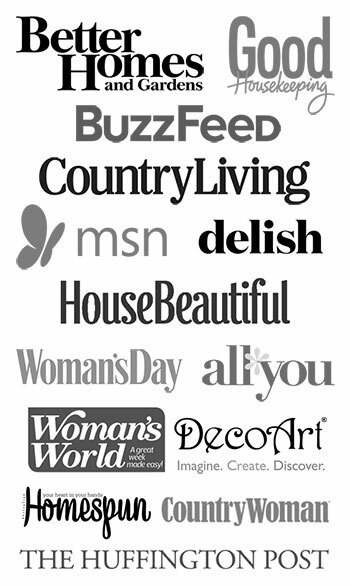 Thanks for the links – darling images!!! 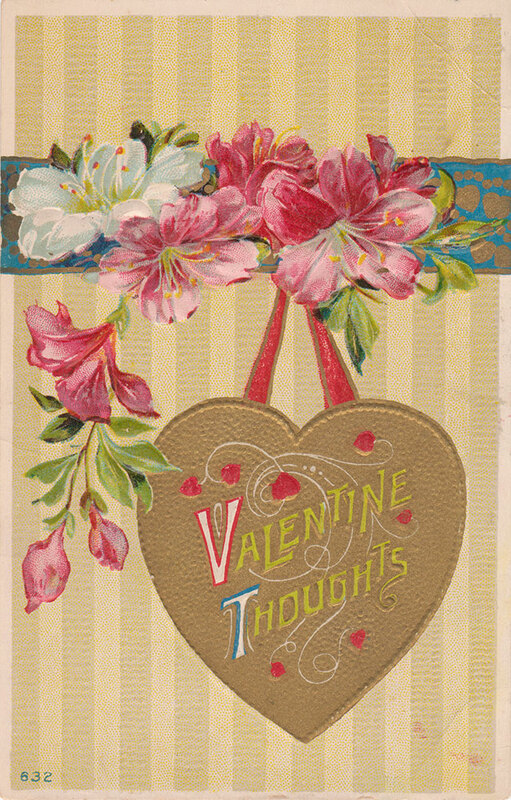 I was just in a thrift store yesterday looking for vintage Valentines for a place card idea I have! This is the perfect post for me this morning, I love your decorating! 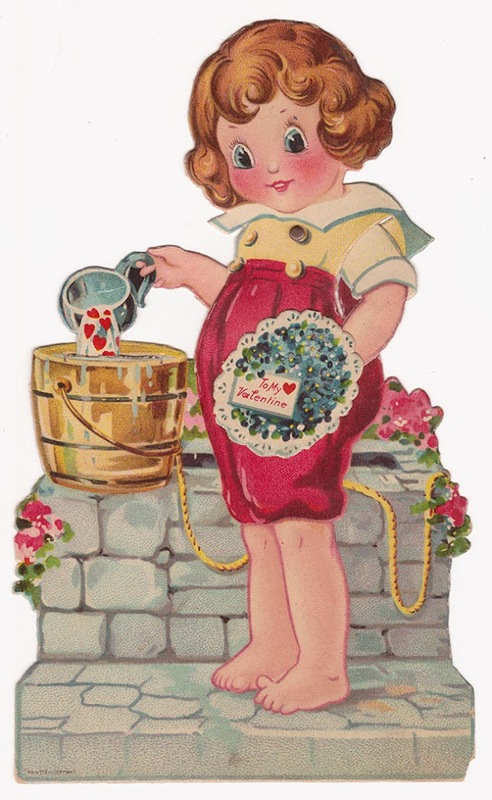 I like seeing all your valentines tucked around your home. I have a feather tree full of them. 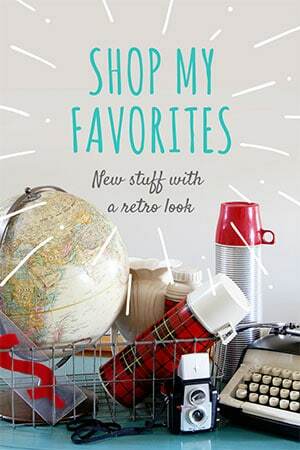 Thanks for sharing a few of your favorites. 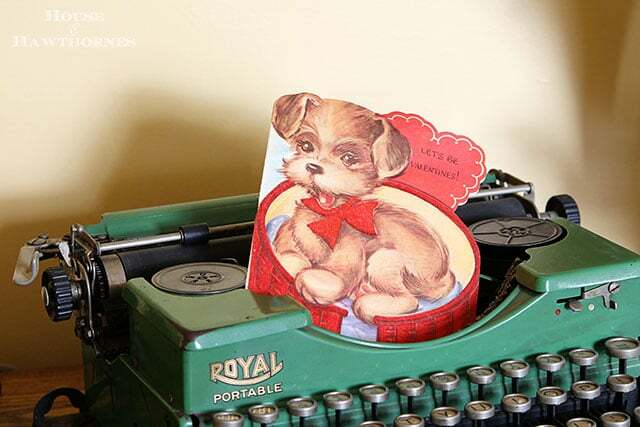 Love the look of your typewriter with the sweet valentine. These are so doggone cute! It’s so sweet of you to share the printables. I go from this “mad decorating diva” for Fall, Halloween, Thanksgiving & Christmas, to wanting lots of calm for the rest of the year. I do minimalist decorating for Valentine’s Day, but I do a bit of tucking here and there. 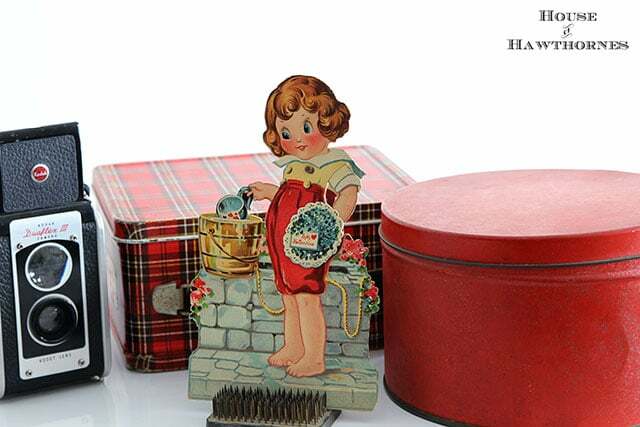 I’m dating myself here, but I still have my little plaid lunchbox. 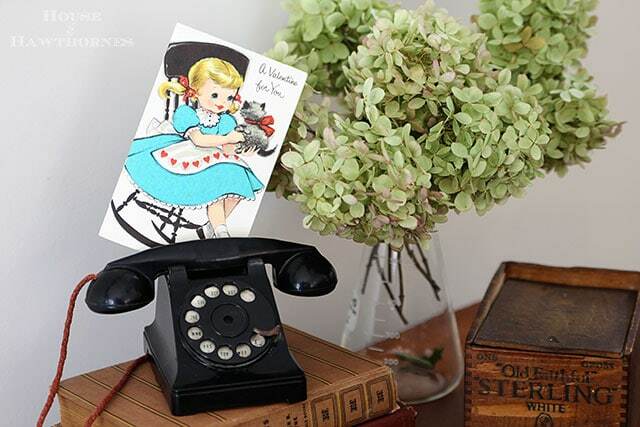 I love the idea of incorporating vintage cards in your home decor. looks awesome! These are charming, Pam! Thanks for sharing! Hope you have a Happy Valentines Day!